Reserve one our Fort Morgan vacation rentals online today and begin planning your ideal vacation. If you’d like to spend your vacation enjoying the white sandy beaches of the beautiful Gulf Coast, then call 3 Palms Rentals today to book your stay in one of our beach front vacation rentals. Whether you choose to relax in the sand getting a tan, visit our famous historic masonry star fort at the mouth of Mobile Bay, looking forward to experiencing all of our beach amenities, such as, jet skis, para-sailing, seafood restaurants, the night life, or catching your trophy fish, 3 Palms Rentals will put you in the center of it all. Book your Fort Morgan vacation rental today! A great beach house with terrific gulf view. 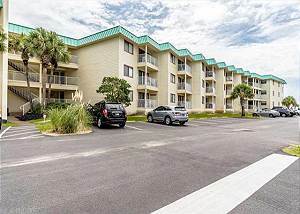 Flat screens in bedrooms.WiFi Upper screened porch, 4 bedrooms, 2.5 baths w/outside hot/cold shower WII console, beds for 10, community pools/tennis, short walk to beach. New into our rental program this 2 bedroom 2 bath unit with gulf view from the balcony and the master bedroom offers more activities in this one complex. Flatscreen tv with cable in the living room and bedrooms. There is a beach service for chair and umbrella rental, 7 pools, 8 tennis courts, hot tubs, saunas, steam rooms, fitness rooms, volleyball courts, horseshoes and shuffleboard and a lighted basketball court will satisfy everyone in your group. Multiple BBQ grills with picnic tables for guest use. If needed, there is a laundry room just outside the unit and down the hall. Activities away from the Plantation are golf in the many courses close by, fort at the end of Ft Morgan Road and a ferry ride to Dauphin Island.